Hi there! Just popping in before the big turkey day tomorrow to show you the little (read: Big. Awesome. Amazing.) pre-holiday makeover Girl Versus Dough underwent these past couple of days. The lovely and fantastic ladies of Wooden Spoons Kitchen literally took all of my random, garbled babbling about all the pretty things I wanted my blog to have/look like and turned it into THIS. They’re geniuses. And magicians. And I can’t thank them enough. So have a look around (especially at the new recipe index!). Take a peek. Do some fiddling (not like with a fiddle, duh — unless you do that, too, in which case by all means, PROCEED). Let me know if anything seems weird or wonky, please. And enjoy settling into this fancied up new home with me. I would have a recipe to share with you today, but 1) I’m about to be all up in Thanksgiving vacation mode soon and I assume you are, too, and 2) the next recipe I have for you is really quite perfect for the weekend ahead. So I’ll be back on Friday with some brunch-like yums for you. Until then, a very happy, peaceful, food-stuffed and love-filled Thanksgiving to you all. I heart you so. Looking SO SHARP! Love the makeover. LOVE the new look and logo – those WSK girls really are magic! It looks fantastic!! Those ladies ARE magicians. Love it. Looks so good Stephanie! Can’t wait to snoop around more. 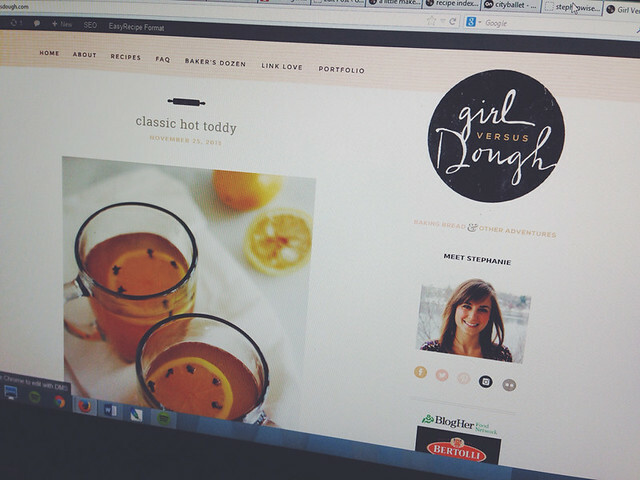 I’m getting my site redesigned in the next month and cannnot waittt!!! This is easily the greatest blog in the history of blogs. All other blogs are inferior. Absolutely beautiful! You’re very brave to do this! Tallest Reporter in Iowa — You would. This looks great. The recipe index makes things so much easier. All the little pictures of the finished recipe helps me decide what to make. Very clever. I love the new look, Stephanie! Your site is so gorgeous!! Not that it wasn’t before 🙂 Have a great Thanksgiving. Looks beautiful! I love the sites those ladies create, just gorgeous!! Happiest of Thanksgivings to you and yours! The new look is beautiful! Love. Loving the gorgeous new look. Simply Amazing!!! Congrats! Looks great, Stephanie! Happy Thanksgiving! I adore your new layout – yay for you! Love the new design; so clean and modern! Have a great holiday!! It’s looking awesome…though it never looked bad 🙂 Have a great thanksgiving Steph! I just LOVE it! So clean and pretty. Hope you have a wonderful Thanksgiving!! Beautiful! I love the new look, Stephanie! Happy Thanksgiving!! Such a great new look! I love the logo and the colour scheme; it’s so pretty but still modern and chic. Erin and Melissa have done another great job! So gorgeous, I love the look! Hope you had a wonderful Thanksgiving! I LOVE IT AHHHHHHH SO MUCH!!!!!!!! I LOVE the new look! So pretty, girl.